Galashiels stable lad Michael Curran is certainly enjoying life after the horse he takes out for gallops made it big for the second year in a row. 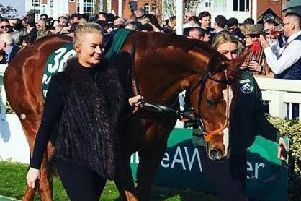 Last year, he looked after the then third-ranked racehorse in the world in Kingman at his boss John Gosden’s Clarehaven Stables in Newmarket, and Curran, who turns 50 in March, could have been forgiven for resting on his laurels. But then along came Golden Horn. That particular three-year-old won the Derby this year under Frankie Dettori – and at the weekend, won the Prix de l’Arc de Triomphe at Longchamp Racecourse in France. And leading him to the winner’s enclosure each time – as well as taking him out each morning at 5am – was Curran, who is beginning to attract almost as much attention as the horses he looks after. He’s becoming known for displaying unbridled passion as his charges do well, and has been interviewed for a Racing Post feature and Channel 4 news. Away from the spotlight, however, Curran is as humble as they come, keen to deflect any congratulations coming his way to the entire team at the stables. Speaking to The Southern this week, he said: “Winning the Derby is hard to beat, but the horse was absolutely brilliant in France. “It was a masterful ride from Frankie. “We weren’t sure what he was doing when he went wide at the start, but he was keeping out of the pack, staying away from the other horses and setting up for what he knew the horse could do ... finish fast. “As we were waiting for the horses to come back, people in the crowd were punching my arm and cheering us along. He said: “Next year, I may not be quite as busy at big races, so I might be able to come back to Gala to take in the Braw Lads Gathering. “It was the love of the common ridings that made me choose a career in horseracing. Curran seems to have the Golden touch, so what are the chances of Curran picking up another legendary horse? He said: “I have been very lucky over the last two years to look after two giants in their field.